Built of limestone and brick in 1658, St Nicholas Abbey is a national treasure in Barbados, having been built just 30 years after the British settled the island and standing as possibly the last remaining authentic plantation home built in the New World. 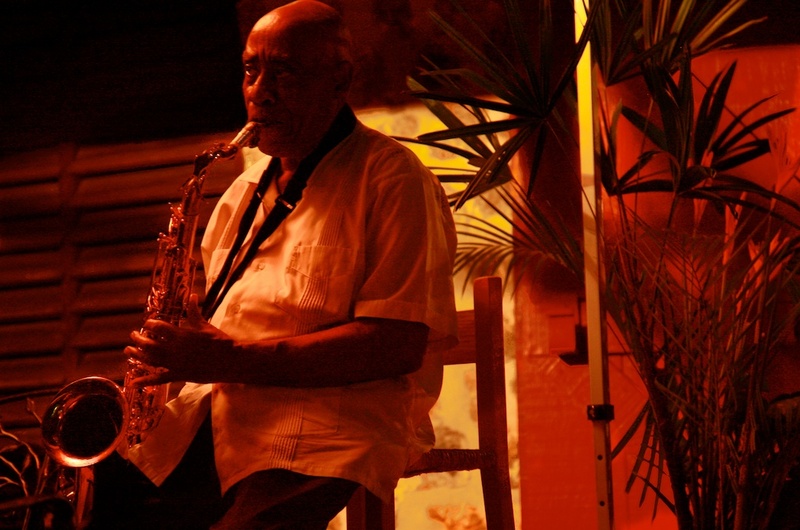 The home is a fascinating tourist attraction, sells very fine rum in beautiful bottles, and – the subject of this post – is the site of an elegant evening out in Barbados. Dinner and dancing beneath the full moon at Barbados’ gracious St Nicholas Abbey is fabulous on both counts. With giant chandeliers hanging from the branches of trees, candles in ornate candelabras sparkling throughout the multi-level terrace, everyone in beautiful dress, and soft live music wafting through the warmth of the evening beneath the heavy yellow moon, I thought I was happily trapped in a Luis Bunuel movie. 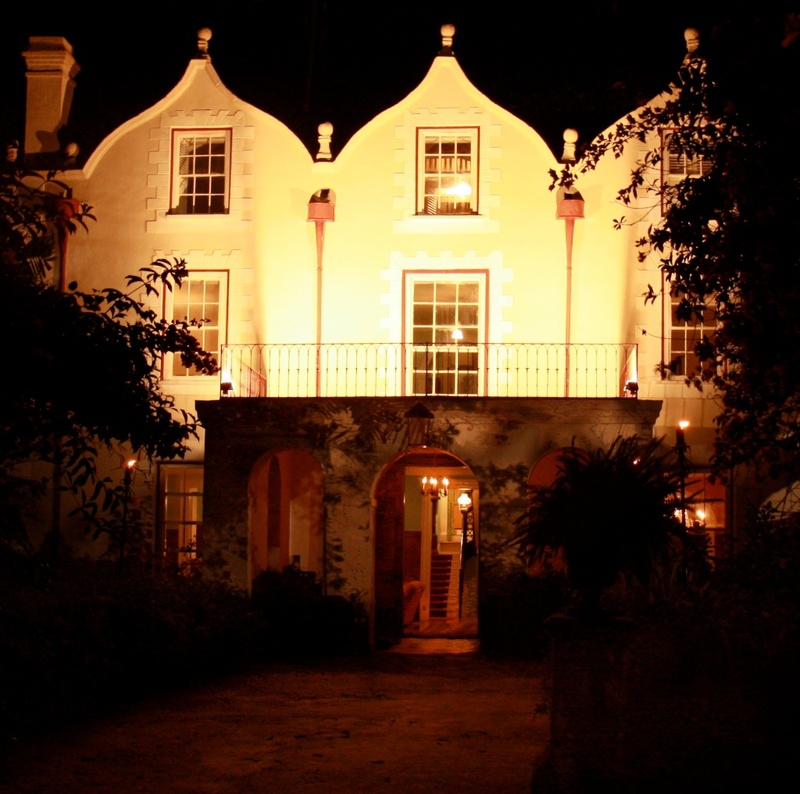 Moods sparkle along with the candles at St Nicholas Abbey's elegant dinners beneath the full moon. The brainchild of architect and St Nicholas Abbey owner and restorer Larry Warren and his wife Anna, the dinners began last winter and take place, weather permitting, on the Saturday evening closest to the full moon during the dry months (that is, not summer). Not widely publicized, and organized only when Larry and Anna themselves are able to play host, call to learn details of upcoming dinners (see below this post for more info). As only 80 diners can be accommodated, the dinners fill quickly. The price is $150Bds each ($75US) plus bar. 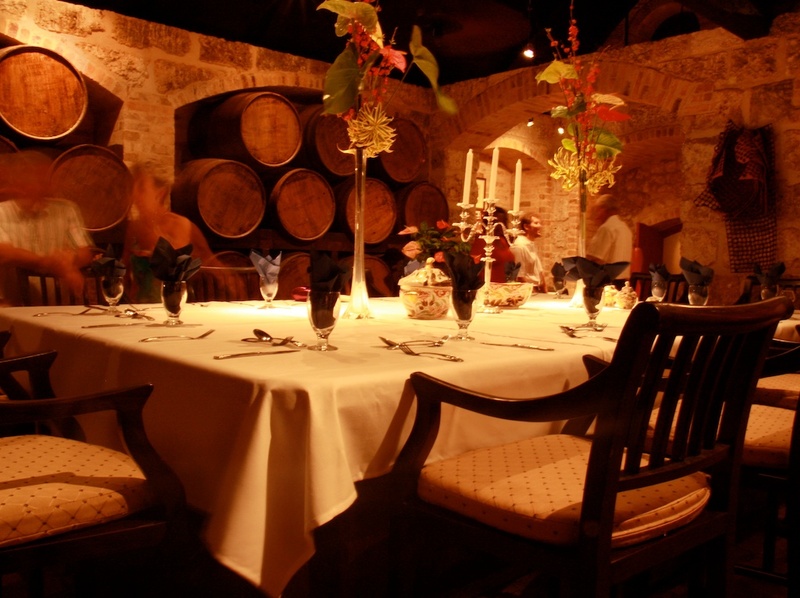 The one indoor table used for the dinner was this one, which seats 14 and sits amongst the rum barrels. St Nicholas Abbey makes its own boutique rum. At the dinners so far, the menu has been a Planter’s Dinner, a feast centered around a suckling pig. Because the dinners are seeing so many repeat guests, Anna told me they’re thinking of playing with the menu and offering a dinner with roast beef and yorkshires and stuffed dolphin (what we Yanks call Mahi Mahi). I myself was delighted by the roasted curly tail of the pig – and was that pig ever delish! The music is outstanding. Past dinners have featured steel pan, a harpist, and a tuk band; I personally adored the jazz musicians last Saturday, perfect for the elegant old-world feeling of the venue. If you thought the paradise of Barbados was only about our turquoise sea and sugar-white beaches, think again. 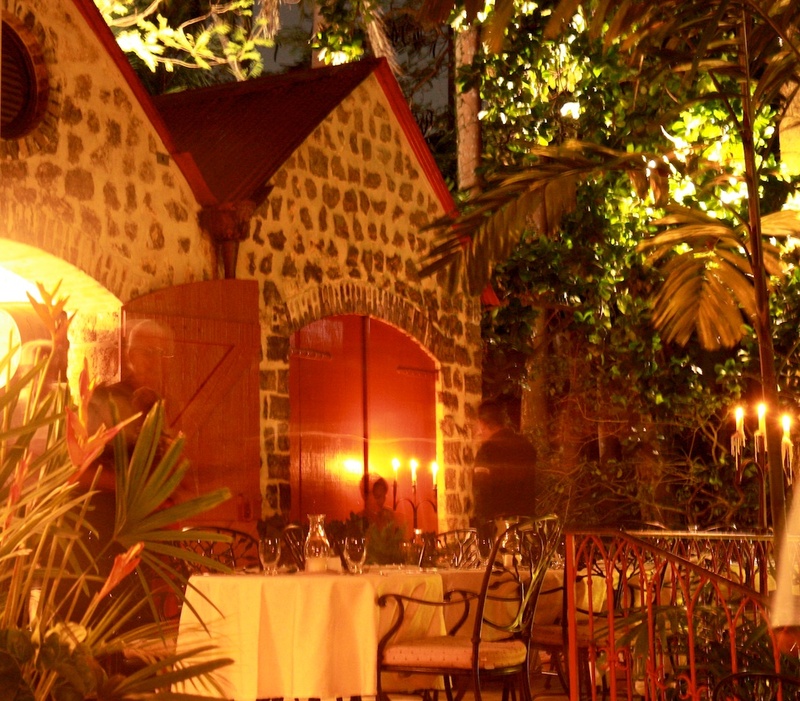 The beautiful full-moon dinners at St Nicholas Abbey add sparkle, warmth, and a fine good time for both permanent islanders and guests to “The Jewel of the Caribbean” that is Barbados. See you there! Wow, amazing blog layout! How long have you ever been blogging for? you make blogging glance easy. The full look of your web site is great, as neatly as the content material!